Sediment resuspension has been recognized as a crucial internal process in aquatic ecosystems. However, there is still a lack of reliable measuring methods due to the complex hydrodynamic conditions in large shallow eutrophic lakes. In this study, sequential sediment traps (SST) and instantaneous multiple point (IMP) methods were compared at 6 sites located in the littoral zone of Zhushan Bay in Lake Taihu. Results show that the average resuspension rates (RRs) estimated using the IMP method at sites 1 to 6 were 266.39, 272.79, 235.17, 254.95, 392.25, and 483.85 g·m−2d−1, respectively. While the RRs estimated using the SST method were 195.16, 236.99, 116.76, 156.23, 389.53, and 509.85 g·m−2d−1, respectively. 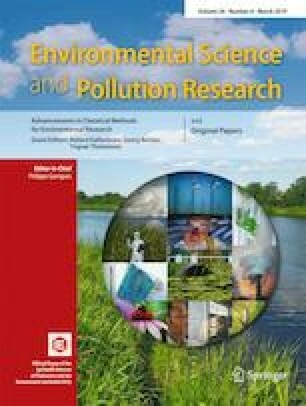 In wind-disturbed areas, both methods were suitable for RR analysis in large and shallow eutrophic lakes and SST provides high-resolution temporal RR estimations. However, in the areas with cyanobacterial blooms and vegetation cover, the IMP method overestimated the RR. Therefore, SST was more suitable across different conditions in large and shallow eutrophic lakes, providing a simple, accurate, and high-resolution temporal estimation of RR, while furthering our understanding of lake evolution processes. The online version of this article ( https://doi.org/10.1007/s11356-018-04059-0) contains supplementary material, which is available to authorized users. Gratitude should also be extended to Ran Lu and Ziya Liu (School of Environment, Nanjing Normal University) for their valuable assistance with nutrient analysis in the laboratory. This research was supported by the National Water Pollution Control and Treatment Science and Technology Major Project (No. 2017ZX07203003), the National Natural Science Foundation of China (No. 41573061), Research Projects of Water Environment Comprehensive Management in Lake Taihu of Jiangsu Province (No. TH2014402), and the Postgraduate Research & Practice Innovation Program of Jiangsu Province (No. KYCX17_1065).